I know I sound very Irish right now, but it's truly is a wonderful life when you are on a diet where can eat unlimited amounts of potatoes in all of their wonderful forms! Here are some simple free or low - syn recipes for some potato faves. Wash potatoes and peel if preferred. Cut into desired thickness. Spray frylight all over the cut potatoes and shake around in the pan. Bake for around an hour on 200 degree heat, turning the chips over and re-spraying about halfway through. Wash potatoes and peel if preferred (I rather keep em skin on!) Cut each potato in half or quarters . Pat with kitchen roll to remove excess water. 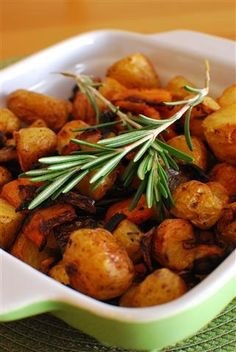 Spray frylight all over the roasties and add any seasoning or herbs. Turn over the potatoes a few times through out the cooking for extra coverage. Bake for around 50mins on 180 degree heat, turning the chips over and re-spraying with frylight about halfway through. Any other tricks for the perfect slimming world chips? Comment below!